The Liberty Harbor North Redevelopment Area was first created in 1973. Fast forward to 2014 and the area has seen new development, renovations, and adaptive re-use on an unprecedented scale. 18 Park is an outgrowth of this re-development and now contributes to the vitality of this urban area. The 11 story building form is made up of a C-shaped 8-story residential tower over a 3 story base. 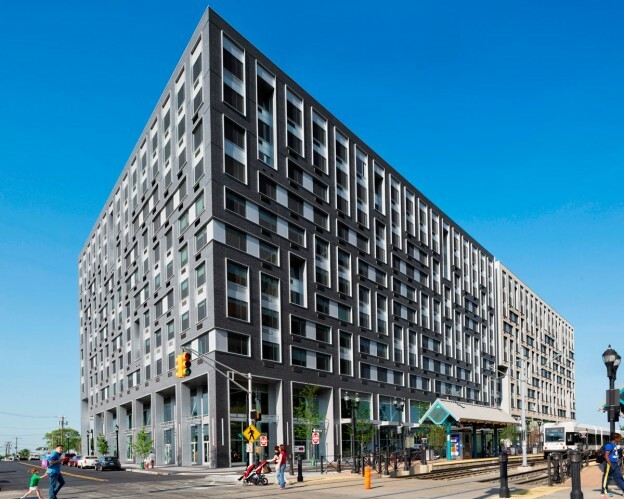 The 3 story base actually created a new city block and activates the new streetscape with retail spaces, townhouses, and a fitness club that serves the teen population of Jersey City and surrounding regions. Hidden from street view at the core of the “base” is a 3-story, 230 space parking garage. The 7-story residential levels above the parking deck embrace a central courtyard that is attractively landscaped for the outdoor enjoyment of all residents. The building form and 37,000 sf upper courtyard are oriented to capture the views of Liberty Harbor and the Hudson River to the south. This entry was posted in Mid-High Rise, Mixed Use, Multifamily/Residential, Sustainable Design, Transit Oriented on November 6, 2014 by swolock.